This is an excessively long anecdote mostly about how (a) I am a bit of a hapless idiot and (b) I have some lovely friends. 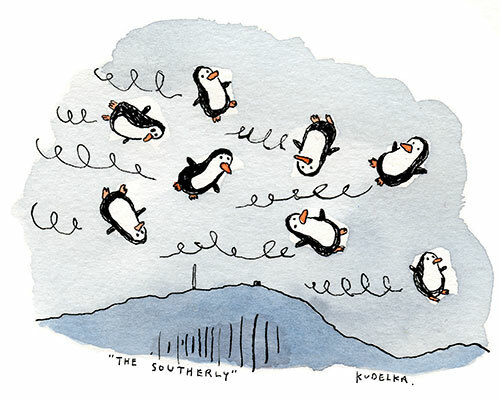 The short versionÂ is: the winter southerly in Hobart is bloody freezing and when a really sharp one was blowingÂ my grandfather used to say “that’s got penguins in it” which has always stuck with me, hence the drawing. Okay, you canÂ go back to facebook now. The longer, mostly unrelated story is a few years back after mum had a brain tumour removed, my very good friend Lee (who is a tai chi instructor as well as cartoonist, so in fact partly useful to society) flew down from Sydney for the weekend to teach her a few basic moves to help her get her balance back. He had a ridiculously early return flight and I dropped him at the airport before dawn. It was a lovely, still, clear morning and on the way back I thought I would drive up to the top of Mount Wellington and watch the sun rise. As you do. Another pertinent factÂ about winter dawn in Hobart is that it takes a surprisingly long time for the sun to come up. Anyway, it was all pretty crepuscular and worth the effort, but I was starting to feel a little hypothermic and I headed back to the car, noticing for the first time a sign saying cars with immobilisers may have problems due to the radio towers on the summit. To cut a long story sort, my car was one of those that had this problem, so I was somewhat stuck. I also had a mobile phone with approximately ten seconds of battery left, so I rang Egg (to give you an idea of the length of our relationship, I gave him that nickname in grade 1). While I was waiting forÂ the cavalry to arrive, nature called, naturally. There are two more thingsÂ you need to know about a windy day on the top of Mount Wellington if you’re going to take a discreet wee, firstly, the wind swirls around so you essentially end up standing inside a cyclone of your own wee and secondly, while you are standing inside your cyclone of wee, a bus full of tourists will inevitably drive past. Anyway, that is pretty much my southerly wind on Mount Wellington story, and any legends of the Mountain Cyclone Wee Man undoubtedly stem from these events. You probably didn’t need to know, but now you do. The happy ending to this story is that Egg did turn up about 20 minutes later and we rolled the car far enough down the mountain to get it going again and then I bought him coffee at the Food Store cafe at the bottom of the mountain and he had a pretty good laugh about it. Originals and prints from Dark Hobart available from the Phone Box Gallery. Aaaaah yes, the stranded on Mt Wellington trick. I was not wearing shorts but on opening the door the sudden gust of wind blew out all my papers and as I dashed out to recover them the wind slammed the door shut, keys inside, no such thing as mobile phone and no other idiots visiting the mountain in a gale. Thank you, Jon, please do not underestimate the great joy both your cartoons and anecdotes bring to others. Do not turn to Tai Chi, you may gain balance and lose your edge.